At The Stonemasonry Company Limited we take great pride in in our work, and in this feature we would like to take a more detailed look at one of our traditional cantilever stone staircases. The Cavendish project (https://www.thestonemasonrycompany.co.uk/cavendish) is a single flight, traditional, cantilever, stone staircase, which was designed for a new build residence in the South of England. The solid Rosal limestone staircase, along with the handrail and flooring featured in this residence (also supplied by The Stonemasonry Company Limited), create the main feature of our client’s entrance hall. One of the main challenges with this project was the very short schedule of work, this meant that the design and engineering process had to be efficient and the shaping and installation had little room for error. We spent a total of 4 weeks on site ensuring all elements were fitted to our expected standard, even given the strict deadlines we were working towards. The nature of our staircases means that the same amount of care and consideration needs to be taken during the design of each bespoke staircase. The size and shape of the room as well as the position of the windows and doors influenced the design. For example, the gentle turn of the first six steps at Cavendish created a smooth transition from the curved wall at the bottom of the staircase leaving a more natural path for people to follow. The smooth soffit complimented the uncluttered feel of the room and the overall style of the interior; a more ornamental style would not have been as effective without any direct natural light below. The apron for this staircase only follows the height of the moulding; this is a subtle way of creating continuity between the staircase and the landing without the need for a full sized apron. Once the final design was agreed, the stone was ordered from Portugal, this usual takes around six weeks before arriving at our workshop, however, with our tight schedule in mind, we did all we could to expedite this process. 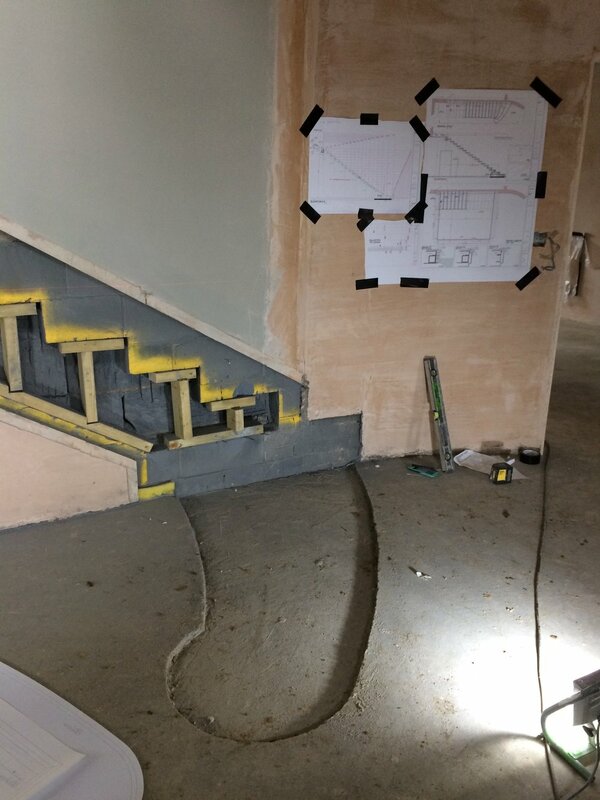 The picture above illustrates two very important elements for the installation of a cantilever staircase. Firstly, The padstone, this is our name for whatever localised structure is in place below step one. This support is there to take the weight of the staircase and transfer it appropriately, this is why the floor build up pictured here doesn’t cover the footprint of the first step. The nature of the padstone is specified by the site engineer but we at The Stonemasonry Company Limited specify that we need a level top and the ability to drill into the padstone to pin our first step. Secondly, The Pockets, these are the holes in the wall that accommodate the ends of the steps. We were fortunate to be involved early enough in this project to request that the wall our staircase bears into be constructed with the blocks layed flat, making it 200mm deep, thus allowing all the pocketing to be completed and temporarily propped with wooden supports as shown. In this instance, all the pockets were cut out before any steps were fixed in place in order to keep the process efficient. This staircase is a particularly fine example of the use of a “2-3-2” spindle arrangement to achieve the widest possible spacing. The maximum opening allowed by building regulations in the UK is 100mm, and so to maximise the opening between spindles, whilst maintaining consistent spacing, the spindles were grouped repeatedly with three on one tread and two on the next. The volute (or monkey tail) on the first step is a perfect match for this traditional Cantilever stone staircase. A large first step allows for 7 spindles to carry the solid sapele handrail around a large radius, producing the beautiful curves as seen below. We hope you enjoyed learning a little more about what we do, watch this space for more posts on what goes into crafting of our solid stone staircases.